Plato wrote: The goal of aesthetics is not simply to copy nature, but rather to peer deeply into her, penetrating her tapestry to understand and employ the same ratios and proportions at work in her beautifully simple but divine order. Plotinus: “The nature of soul, spirit, is easy to attract, but that if someone were to construct something sympathetic to it and able to receive a part of it, it would of all things receive soul, spirit, most easily”. The Great Pyramid, was built for the Egyptians to advance their spiritual consciousness. It was also built for us, long after the Egyptians, as an example of how to build to advance our consciousness,a gift to us. 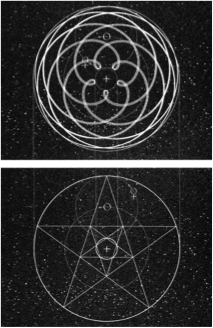 It is a structure of pure resonance using the purist forms of the universe, Sacred Geometry to advance consciousness. It was built to withstand through time, presence on earth as long as earth exists as an example of how to build. 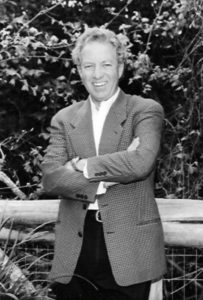 We have been shown how to build to advance our spiritual consciousness, here on earth. How to connect to the spiritual resonances that is present within our universe, heaven. Long after the completion of the pyramid, Plato and Plotinus got it. They wrote about, ‘how we should build’, to connect with spirit, as stated above. Following are examples of how this is to be completed for our benefit to expand our consciousness. This can easily be exemplified by the design of the cube house. 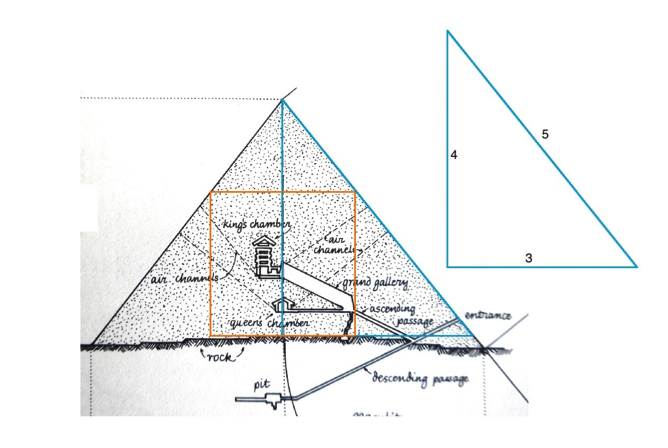 As stated above, the design core of the great Pyramid is a cube. 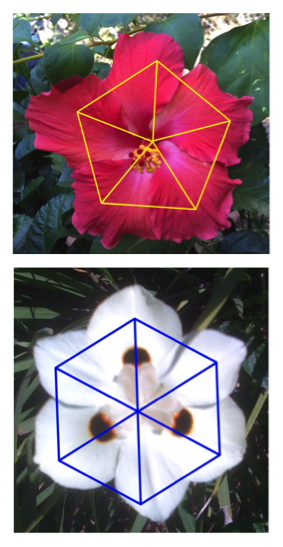 And, it has also been explained the inherent benefits of the geometric make up of the cube. IE: the 1:1:1 geometric relationship of the elements of the cube manifests the presence of God within the cube. 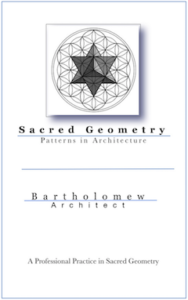 Ref: Sacred Geometry: Patterns in Architecture. We were shown in the great Pyramid, just copy the basis of design. The purpose of human presence in this world is to provide balance between the changing and the unchanging. Sacred Geometry presence within our architecture will provide that balance. The kiss of Venus and the geometric patterns of nature have previously been described uniting our universe with nature via geometric relationships. A simple garden gate, below, has the same geometric pattern of our planets orbits, patterns of nature, with entry to our garden. This is how it happens in nature. This is how it is to happen in our architecture. 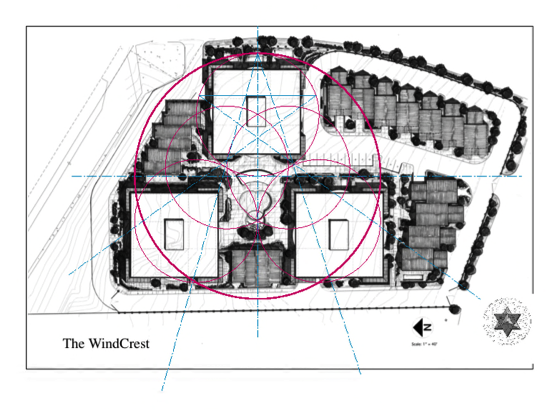 Just copy the sacred proportions and ratio found in nature, our universe into our built environment. This simple garden gate copies the sacred residence of Phi,ø. This is the same resonance radiated by the orbital pattern of Venus around earth. The same resonance radiated within nature. 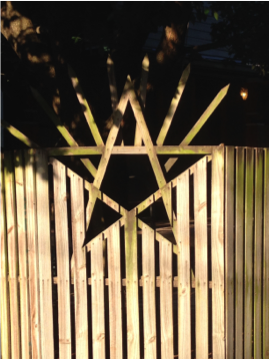 This simple shape on a garden gate, permanently resonates the pure simple spiritual energy of Phi, ø, into our environment. The plan of this structure is a simple star shape form. This shape indicates suggested movement, spinning with a center of movement, rotation, a star. This center is a point of non movement, a transcendental opening to energies not accessible outside this center point. This suggested spin creates a resonance with heavenly bodies within our universe. 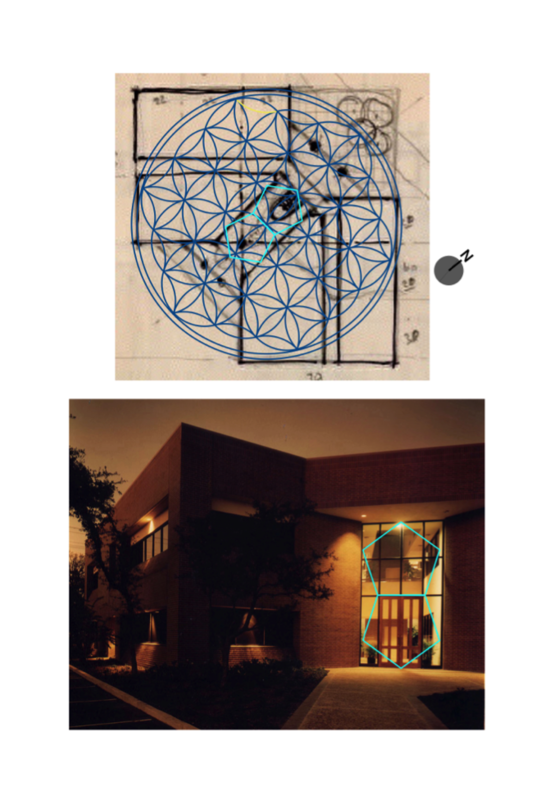 The center is at the center of the Flower of Life superimposed over the plan shown at left. 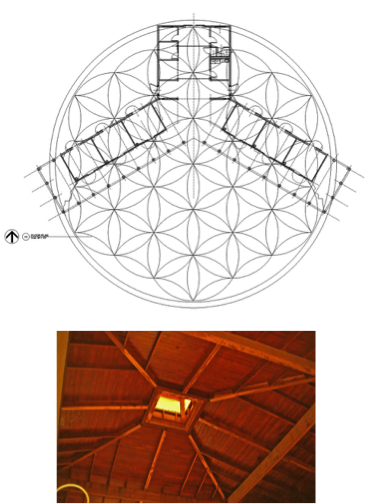 The roof structure of the center portion is formed with the structural members at the same 3:4:5 angle as the slope of the Great Pyramid radiating the resonance of Phi, ø, a the center of the architecture. The stalls are all in the shape of the pentagonal shape, again radiating Phi. The medical building above indicates the elevation study of overlapping geometric forms from the windows, to door openings to the fenestration of architecture forms on the elevation. These forms are the same as in the structure of nature. 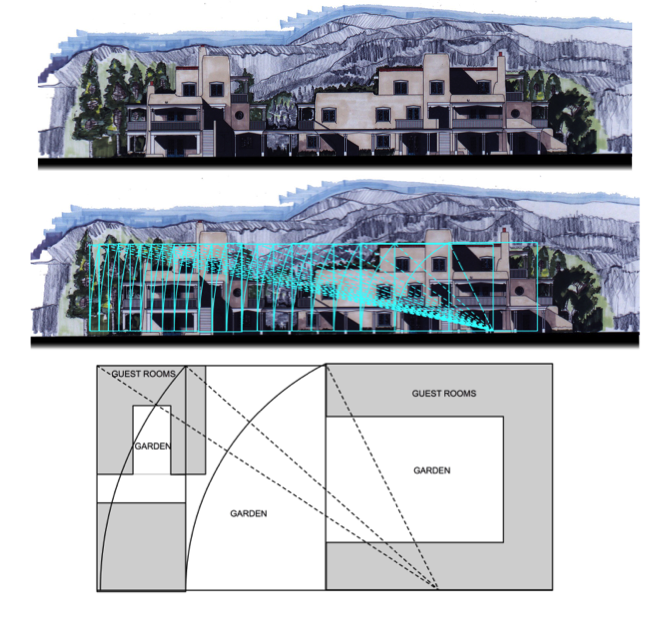 The elevation study at right indicates the forms on the elevation that need adjustment. The overall elevation is in unison with the Vesica Piscis form. The elevation and the floor plan below elevation are in unison with Vesica Piscis. The Vesica is a unifying form. As above , so is below. Universal consciousness and empirical consciousness, man/woman in unison with architecture. The purpose of Sacred Geometry is to unify our life with divine consciousness, as does nature. 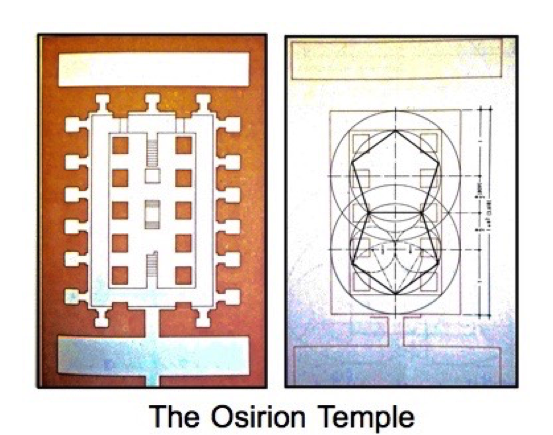 The Osirion Temple in Abydos, Egypt is a purely sacred geometric form. It is sited with a number of other larger funerary structures in Abydos but this temple was the favorite of a number of Egyptian kings. Legend records that Osirius was entombed within this structure, ascended to Christ Consciousness and was resurrected within this structure. Christ Consciousness is a unifying geometric grid of spiritual consciousness enveloping the earth, to this day. This grid holds our spiritual consciousness for our spiritual growth. All five solids fit perfectly within a cube all sharing a common center point. This center point is a point of rotation and is known as the power spot, point of transformation, it is a still point beyond space in time with access to angelic realms not accessible beyond the center point of rotation. As explained in more detail in, Sacred Geometry: Patterns in Architecture, the cube has been used as the core element of design in many traditional mono theistic cultures. Early Judeo-Christian and Traditional Muslim structures utilized the cube in their basic design. The arc of the covenant is recorded to have been stored in a cubic room in Solomon’s Temple. The Kaaba is a cubic structure where Muhammad has said Ala resides. The floor plan above is a 45,000 sf office building nested within the Flower of Life pattern with lobby orientation to the north. The lobby floor plan shape is based on the Osirion, two back to back icosahedron caps described above. The glass atrium entry elevation also is two icosahedral patterns again radiating the geometric form of Phi. This small office building is a successful Sacred Geometric building. This is a boutique hotel in Santa Fe just west of downtown. 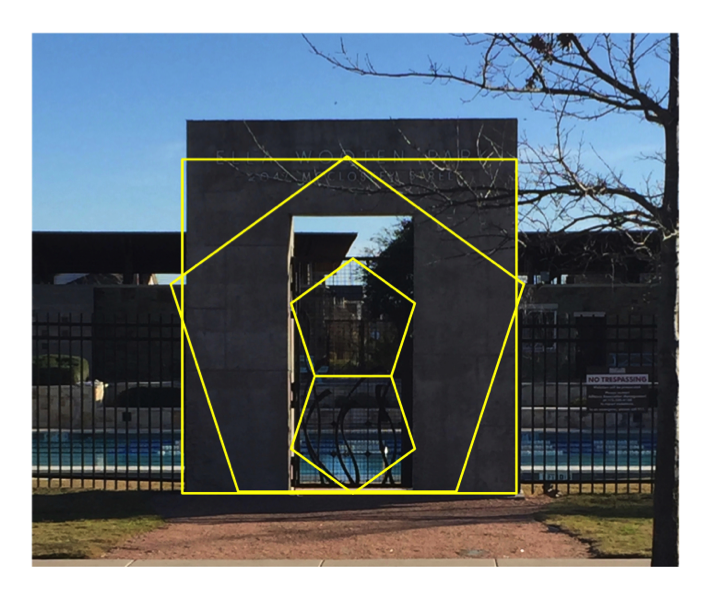 It is arranged in two buildings laid out within the Golden Ratio pattern. Three court yards link the three buildings, but the true unity of the forms is the Golden Ratio. This pattern links the resonance of the universe, nature and this structure together. This is an entry to a small office building. During the design process, the redesign shown in red and yellow would be simple to achieve with no additional cost, and union with nature. This high rise residential project was designed in three towers and smaller two story town homes. The redesign is to two towers with heights to be in Golden Ratio. 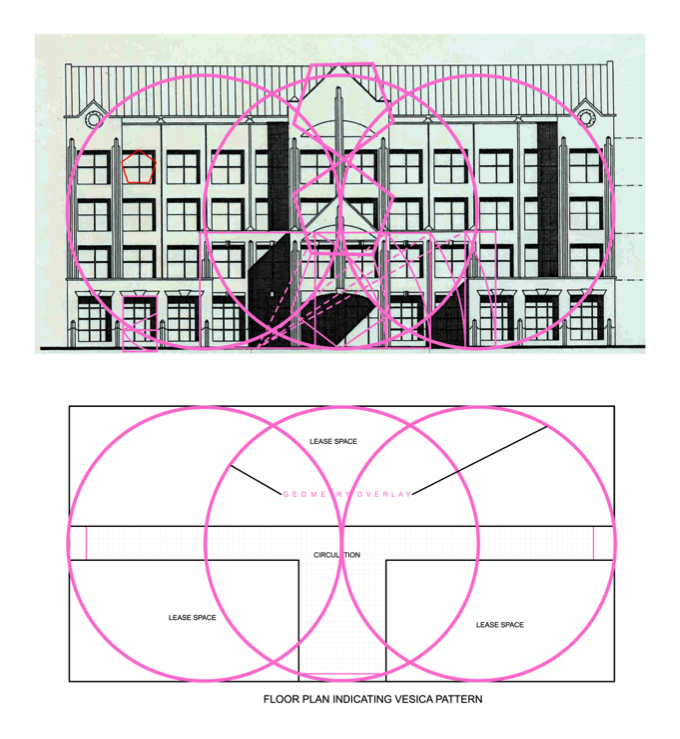 The new site plan is laid out with the all components relating to each other in a square roof of 5 pattern. This is a recently completed project in Austin. The original program was for a simple box. The lean-to family room was added after design started. At completion the clients comment: “I gave you a box, a simple box for you to design as my house. In walking through my house, you have designed a house that lives and breaths”. The basic form is pure Sacred Geometry. The client knew nothing nor had an appreciation of Sacred Geometry. The Floor plan is all in Golden Ratio. The elevation is all in Golden Ratio. 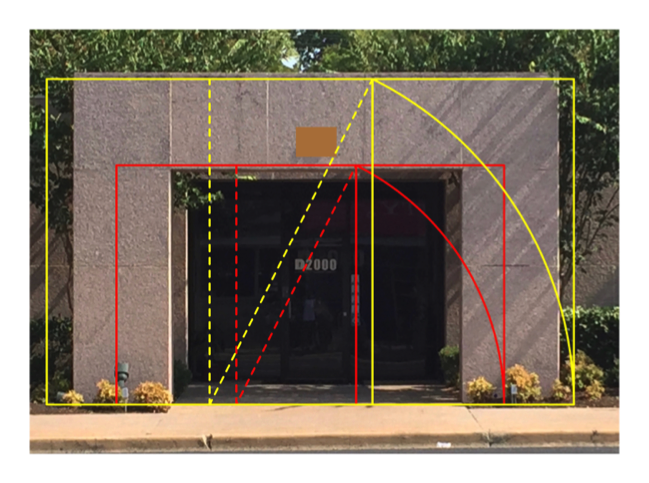 The second floor framing in the photo is exposed and is all Golden Ratio. Our universe and everything within it was built by God with the spirit of Sacred Geometry as the unifying element. Everything in nature, in the universe, is designed with Sacred Geometry as the binding spirit to unify. Everything except what man builds for himself. The purpose of Architecture is to act as our second skin, to free our spirit, as does nature. For man to act as the Godly spirit which we are, to be the unifying element in our universe, we must build our environment with the elements of our universe and nature, Sacred Geometry.